My baby shower was on Sunday and it was aw esome. We got so many beautiful gifts. We are so honored to have these wonderful family and friends in our life. We could not do this without you. Thank you to the hostesses of this party, Becky, Annie S., Niki, Harriet, Jennifer, Kelly, and Angela! It was spectacular!!! Here are a few highlights. Worth even got his own present, a beer, from his buddy Morgan. Annie S. made a 5 tier diaper cake with instructions on when I use the diapers. She knows me so well. Plus the cake for the shower was so beautiful and so good as was all the food. As party favors Becky had M&Ms made that said Bella Rose on them. I forgot to get some from her so I need to do that soon before they are all gone! If you ever need a party done right these are the ladies to do it! Thank you everyone. I wish I could put all the pictures online and thank you all individually, but that would be a VERY long post. It was so much fun and we feel so honored! i know we have been pretty girly lately with all the pink and talking about baby so i thought i would do a tribute to all the newphews in our life. see BellaRose is coming to help the girls out. the girls are far out numbered. there are only 2 girls and 5 boys. i will post pictures of the girls later, but we just had a bunch of pictures of the boys so i thought i would introduce them to you. they are all blonde too. so do we think that BellaRose will be blonde, brunnette, brown eyes, blue eyes? this is a hard one. Rocco (the youngest), the 2nd from top is from my middle sister. She is colored like me and her husband is blonde blue eyes. Christian, top is the oldest at 7. His mom, my oldest sister is also dark like me and she married a blonde blue eyed british man. Below far bottom is Ethan. He is Worth's older sister's middle boy and he is the most blonde. Cameron middle is very blonde and blues and he is my oldest sister's. Last but not least is Noah, he is Worth's sister's oldest. Here is trying to jump his 4-wheeler and is doing a pretty good job. Same story blonde/ blue eyes. So i ask you what will BellaRose be? Taylor my niece is the only one with brown hair and brown eyes. Remember these pictures? Remeber how terrible it was? Well look at it now. Isn't it perfect? This is what we did this weekend. We got out nursery together. It becomes more and more real everyday! I put the changing table together all by meself! I am so proud of my self. Of course it only had like 14 screws and allen wrench, but hey I will be 32 weeks tomorrow and putting anything together is no easy task. I am starting to have people ask me about my belly and I really just don't know what to say to them. "Yeah having a baby" is what I say but really what do you say when people say "look at your little belly" and I want to say "yeah look at yours" :). No one has touched me yet, but I hear that happens! Look how pretty the nursery is looking. Isn't it wonderful! My visions for this room are coming to fruition and it is just as I wanted it. I know that Bella Rose will be thrilled. The trim and the chair molding just brought it all together. 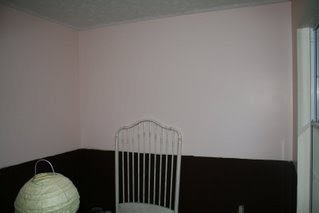 The goal is to have the nursery done this weekend. Worth has to finish up some trim and then the crib will go up. I hope to have it all done by my shower on the 25th so I can start "nesting". On another nursery note the lamp came in from my mom. The picture is below in an earlier blog. THANK YOU again Mom. It is going to be perfect! I will have pictures on Monday. On another note it is my Dad's birthday, the original Godfather! 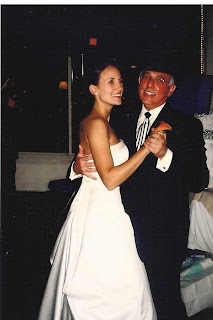 Here he is dancing with me on my wedding day. He was not quite sure how to dance to bluegrass, but I would say that this Italian man from Pittsburgh did a pretty good job. Happy Birthday Bucko, I love you! This is my house last spring and summer. The weather has just been so unreal here and I want to plant, but I know Old Man Winter is not through with us. I know just when I start getting sure of myself he comes and kills all my beauty so I will look at these pictures and be satisfied for now. Isn't it wonderous? I have big plans for my garden this year, big plans I tell you. You will have to wait and see or just come over! Rainy is having mental issues right now. She is being needy. I think that she thinks she is fat, maybe b/c we tell he she is fat. Don't think that we are bad parents, we are just kidding with her. Is this how it starts though? Will she no longer want to eat? I don't think so. We are trying to retrain a 7 year old lab. Do you think that it will work? We will let you know. She has become militant in her old age. She wakes us at 5 with a dog food bowl to the head (literally). When we come home she yells at us to be fed. We are trying to change her internal clock. This is what happens when you do that. They become insecure and want to be in laundry hampers. We came home from a friends house and Worth put his puffy jacket in the hamper and Rainy decided that is where she needed to be. She has NEVER done this before. All we could do was laugh and then take a picture! Atticus is doing fine. Lisser just wanted a picture so here you go Lisser. He is still pretty much oblivious and I so love him for that. He did have another kill this past week. Another rabbit out of our yard. Sweet boy, I think it really shocks him when he finally gets one. Have you ever heard a rabbit die? It is a terrible noise. I don't recommend it! So I am a little embarrased by our water heater. 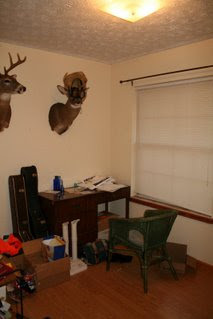 This is what it looked like when Worth removed the shelves and we were really able to see what is behind it. He found many things, 2 ashe trays (we don't smoke), a phone book, paper cups, pot lids, just to name a few. We fear these have been there since worth bought the house. The back of the water heater was baiscally exploded. I wonder if this could explain all the water damage on the floor? This water heater is now gone. Replaced by a pretty white one that does not leak. It was laying in our yard waiting for trash day, I have to admit we looked pretty trashy, but this family came by and picked it up wanting to sell it for scrap metal. I hope they make money! Our wood floor is down! No more wood floor to lay. I am thrilled. A lot of the tools are out of the house. I feel like we are getting close, but we are far from it. I have a false sense of security. I need to get over it. We still have to re-trim the whole house. Get a closet built so I have my kitchen table, bakery's rack, nursery, and guest room back. So we are far from done, but look at the progress!